Last summer Gajah (aka Oaxis, their consumer brand) unveiled a trio of smartphone cases which added E-ink screens to the back of the iPhone 5 and 2 of Samsung's smartphones. As cool as these products may have looked, they suffered from an unfortunate limitation: they only worked with specific models. Gajah is back again today with a new modular case system that overcomes this limitation. They've designed a new smartphone accessory with a 3.5" screen which is designed to snap into a variety of smartphone cases, and they are going to be showing it off at Mobile World Congress in Barcelona this week. 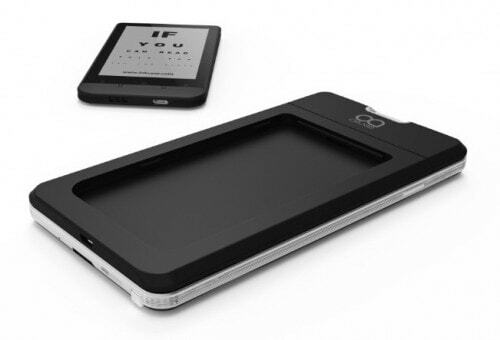 Do you remember that 3.5" ereader slash smartphone accessory I discovered at CES 2014? That is part of the new InkCase Plus universal smartphone case. I didn't see the other half of the modular case at CES, but I did get a number of details on and photos of the ebook reader. The IC3510 is designed to pair with smartphones over Bluetooth, and it has its own battery, CPU, and a limited amount of storage. And according to the signs I saw in the E-ink booth, it also has a 3.5" Mobius E-ink screen with a screen resolution of 360 x 600, or around 200 ppi. 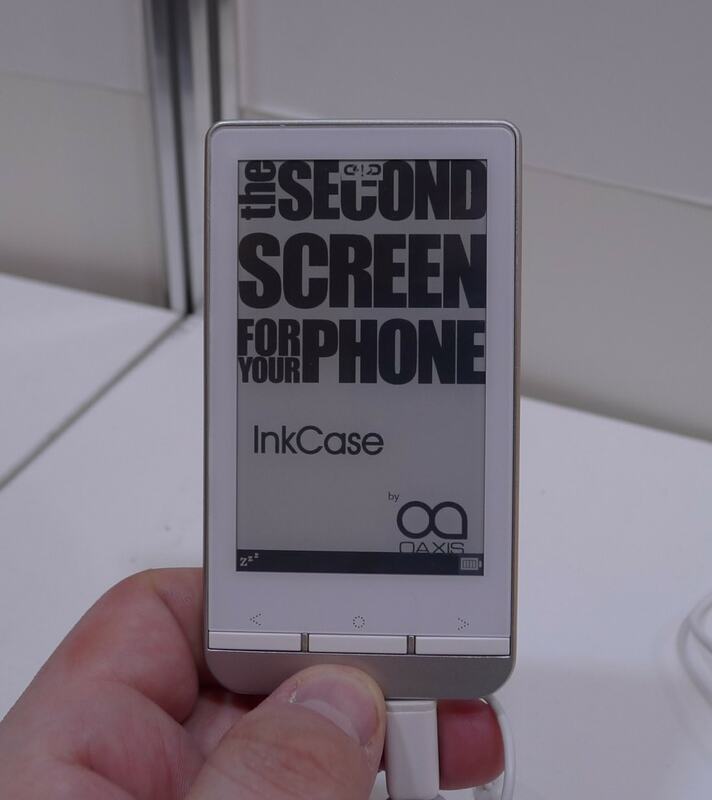 The InkCase Plus is the second consumer product to use E-ink's new flexible screen tech, which was unveiled last Spring. It's far smaller than Sony's 13.3" E-ink writing slate and it also boasts a sharper screen resolution, and like its larger sibling this smartphone case has a screen that is more durable and rugged than most E-ink screens - or most smartphone screens, for that matter. The InkCase Plus will work with the apps developed for the earlier InkCase models, though that's not saying much. When I reviewed the InkCase N2 last fall, I found that there really wasn't much I could do with it due to the lack of compatible apps. That model had the guts of an ebook reader, but it could do little more than display photos and images sent from its companion smartphone. I could read ebooks on it, yes, but only a single page was sent at a time. In the months since I posted that review, only a couple new apps have been released. One was mentioned in press release, InkCase Sports, which acts as a bike sports timer. Gajah has reportedly released an SDK so developers can develop apps for the InkCase Plus, but I don't have any details as to how one would gain access.